Rivane Neuenschwander, Secondary Stories, 2006 Mixed media installation, © Rivane Neuenschwander Collection of the Linda Pace Foundation. 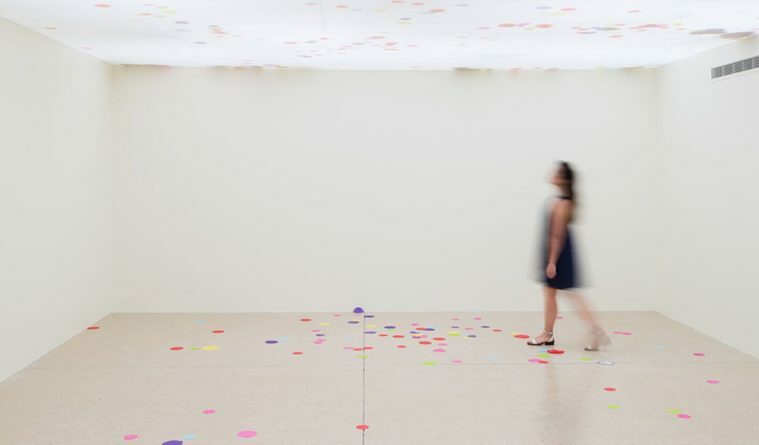 Fun is a quality sadly lacking in much contemporary art, but Brazilian artist Rivane Neuenschwander showers viewers with giant colored discs of confetti at the Linda Pace Foundation’s SPACE. 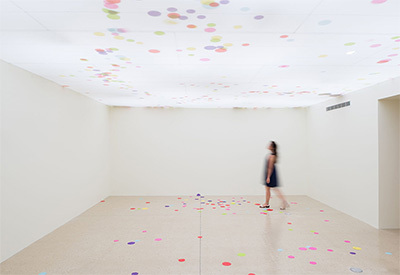 Inspired by Brazil’s Carnival, her Secondary Stories is a room-sized immersive installation featuring a dropped, translucent ceiling partially filled with shifting, plate-sized, colored-paper circles blown about by rotary fans. Occasionally, individual giant pieces of confetti drop through holes in the ceiling to flutter leaf-like to the floor. Seen through the backlit ceiling, “secondary” colors are revealed when the primary colors of the paper circles overlap. The pale light shining through the circles is soothing and dreamy. The kinetic play of the circles overhead is mirrored by the abstract, op art patterns formed by fallen circles on the floor moved about by visitors. 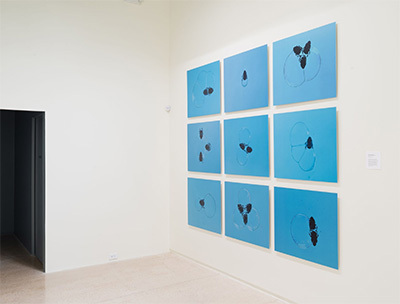 The fans start up randomly, and the artist has provided the gallery watchers with explicit directions about maintaining the installation, such as how many new circles can be added each day. Confetti is an important element of her video installation, Quarta-Feira de Cinzas/Epilogue, which views the aftermath of Carnival from an insect’s point of view. 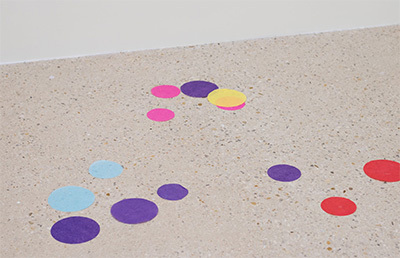 Made in collaboration with Brazilian filmmaker Cao Guimarães, the video shows black ants scurrying about carrying pieces of confetti that dwarf them, eventually finding their way to the underground nest where they store the pieces of brightly colored paper. For what purpose? Perhaps to start their own celebration, Neuenschwander muses. But the video reflects the sobering cleanup after Carnival, when Lent begins and control and order are restored. Inspired by someone drumming their fingers on a box of matches, a musical “instrument” associated with samba, the amazing soundtrack by O Grivo, a Brazilian audio-visual artist duo, adds a wonderful sonic dimension to “Epilogue,” punctuating every turn and movement of the restless ants. The sound of matchsticks falling to the ground mingles with natural sounds in the soundtrack based partly on the 1951 song “Me deixa em paz” by Monsueto and Ayrton Amorim. The director, artist and O Grivo are from the same town in Brazil, Belo Horizonte. During her 2001 residency at Artpace, Neuenschwander created a cardboard maze that led to a video she made with Guimarães showing ants, each carrying a paper inscribed with “WORD” on one side and “WORLD” on the other. Since then she has had major shows at New York’s New Museum in 2010 and Brazil’s Museu de Arte Moderna de São Paulo in 2014. In its Texas debut, Secondary Stories shows Neuenshwander hasn’t lost her fascination with the fleetingly magical.